The Shichi Fukujin ('Seven Happiness Beings' or 'Seven Lucky Gods') of Japan. This photograph was taken at the Origami Kaikan (origami hall), an origami supplies (and other washi products) shop in Tokyo. 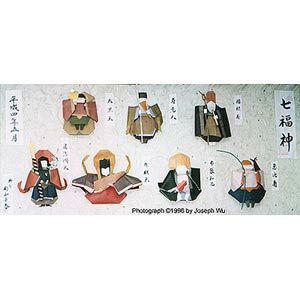 Shown in the small image is Hotei ('Cloth Bag'; god of generosity). See the larger image for all seven gods.